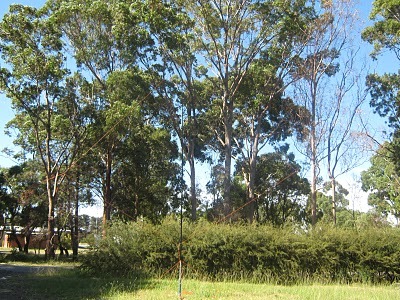 In preparation for our upcoming French Island trip, today I went to a park and challenged myself to erect a full wave quad loop using only a 9m squid pole, some ropes and 7 tent pegs. 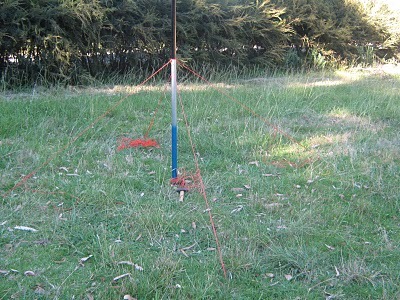 My quad loop for this exercise is made from a 22 m length of insulated 13 x 0.12 mm sq wire. This different from the quad loop I have used before. My previous loop is made from twin flex and significantly heavier. First up I needed to get the squid pole to stay upright so I set 4 guy ropes and used a figure 8 knot to secure the guys at the bottom of the second lowest section. I had to adjust the size of the loops to ensure it was a tight fit on the second section and wouldn’t move down to the first section. The guy ropes were taken down to tent pegs and secured with a rolling hitch. 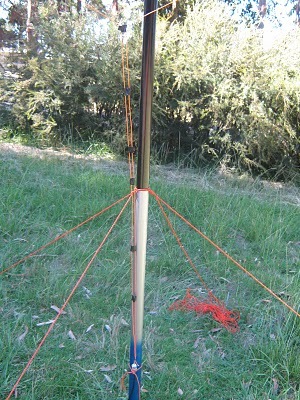 I also tied the bottom of the pole to a tent peg to stop the base moving out if the wind picked up. Before I stood the pole up I pulled the top section out of the pole as it can’t be reached once the pole is upright. After securing the pole I placed the centre of the loop over the top section. Like the guy ropes this has a loop in it that keeps the wire at the bottom of the top section. I used two cable ties to secure the loop. Once extended the top of the loop will be about 7.9 m above the ground. I then extended the pole until I had 5.5 m of wire on each leg in the air and then made loops in each leg, again with a cable tie, to attach ropes to pull the sides out with. I attached the ropes and then fully extended the pole. By this stage the wind had picked up a little and the pole was being blown around a bit. I ran the two side ropes out and pegged them to the ground so the bottom of the loop was about 10 cm off the ground. I attached a coax, set up my FT-7 on battery power and checked the SWR. The SWR was 2.3:1 on 14.200 MHz and a little better on 14.010 MHz and a little worse on 14.300 MHz. This suggested to me that the loop was too long. Rather than get the cutters out and start trimming I thought I would try adding a parallel line section at the feed point. So with some PVC tape I taped about 500 mm of wire into two parallel wires about 10 mm apart. The SWR was reduced to about 1.8 :1 so I taped up some more. Again the SWR came down. After taping up 1.1 m of wire the SWR at 14.200 MHz was 1.3:1. This I could live with so I left the antenna at that. I tuned around and heard a couple of QSOs. I found a clear frequency and called CQ. After 5 or 6 calls VK2BNG came back to me. He gave me a 58 report although there was a bit of QSB on our signals. I chatted with Binu for a good 15 minutes and everything performed well. After signing with VK2BNG I made a few more calls but got no response. At least I know it works. The loop is now uneven as the lower sides are only 4.9 metres long and the top sides are 5.5m. If the weather is cool over this weekend I might go and set up again and adjust this to see what difference it makes, if any. You are right, my test frequencies were 14 MHz not 15 MHz. I have corrected my blog to reflect this. 100 to 120 ohms is correct but I think the parallel line I have made at the feed point is acting as an impedance transformer. I certainly got more output from the transmitter when the SWR came lower so it can’t be all bad. I will try a balun next time I set up and see what difference it makes. G’day Peter, a couple of things to try. I. 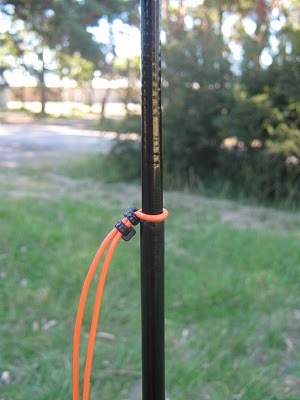 Try a 1:1 choke balun at the feedpoint of the loop for decoupling purposes. When wound on a ferrite rod (bifilar winding) they are compact, lihgt and easy to make. 2. Your SWR readings are possibly misleading as a full wavelength loop at resonance is 100to 120 ohms, therefore directly fed into coax the swr will be around 2:1. Felix vk4fuq. PS. I presume your test frequencies were 14 MHz, not 15 Mhz!